November-2011 News & Updates from the City of Ulhasnagar/Sindhunagar, Maharashtra, India. Ulhasnagar City News indexed across timeline for easy retrieval. MNS poll aspirants see merit in Hindi TNN | Nov 24, 2011, 04.39 AM IST ULHASNAGAR: The upcoming civic polls seem to have convinced the Maharashtra Navnirman Sena chief Raj Thackeray about about the virtues of multiculturalism. MNS chief Raj Thackeray may refuse to speak any language other than Marathi, however, party leaders hand-picked by him in Ulhasnagar do not seem to share their party chief's xenophobia. The sizeable Sindhi population has forced MNS poll aspirants to campaign in Hindi. Dinesh Ahuja, an MNS leader who may contest the civic polls from Ulhasnagar 2, is using signboards in Hindi appealing voters to join the party. He has also put up signboards in Marathi, however, he feels use of Hindi will give him "visibility". "I have installed signboards in Hindi and Marathi so that my voters clearly understand the party's message," said Ahuja. Sachin Kadam, chief of the party's Ulhasnagar unit, said, "Ahuja has not taken the party's approval before using signboards in Hindi. We will remove them.". In Ulhasnagar, 60% of the population are Sindhi speaking community. 7L gold, cash looted from bizman's home Pradeep Gupta | TNN | Nov 21, 2011, 04.16 AM IST Ulhasnagar: Five robbers threatened a businessman's family at gunpoint and escaped with Rs 5 lakh cash and gold jewellery worth Rs 1.68 lakh at Ulhasnagar on Sunday. One of the robbers had kept a security guard confined to the building gate at gunpoint so that he could not raise an alarm. The incident took place around 3.45 am. Of the gang of five, four entered the first floor flat of Premchand Narwani at Sai Charan apartment of Gol Maidan. Premchand's wife and son were in the house at the time. The valuables in the house were meant for Premchand's son's wedding in February 2012. Did Salman Khan apply for constable's job? Mumbai | Mid-Day.com | Updated: November 18, 2011 11:29 IST MUMBAI: If application records at the Worli police recruitment camp are to be believed, Bollywood icon Salman Khan has now decided to join the police force -- no, not as his screen persona of Chulbul Pandey, but Khan incarnate wants to be a constable. In a major goof up, an online application form submitted by candidate Manohar Dilip Sansare erroneously showed the photograph of Khan, on the eve of his physical exam. Sansare, a resident of Ulhasnagar, was getting his attested documents ready on November 10, when he got the most incredible bit of information. A friend, who had also applied, called to inform him that his online application form showed a young Salman's mugshot, instead of his own photograph. Sansare was scheduled to submit a hard copy of the form at the Worli recruitment camp the following day, when they reported there for a physical exam. "Initially I thought it was just a prank, and laughed the matter off. An hour later, another friend called me, with the same bizarre news. Alarmed, I decided to check my application online, and rushed to a cyber cafe. At first I thought the entire thing was funny. But since we had a physical test and document attestation scheduled for November 11, the next day, I got worried," said Sansare, recalling the incident. "I hurried to the commissioner's office in Ulhasnagar, and informed the officials there about the strange error in my application form. An official spoke to the recruitment officer in Worli, who assured me that I would be allowed to appear for the physical exam the next day," added Sansare. 'Are you Salman?' The next day, Sansare reported to the recruitment camp in Worli on time. After waiting in a queue for nearly one-and-a-half hours, he stepped up to submit his papers. 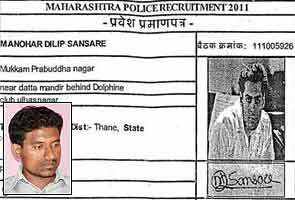 One of the constables noticed the actor's photograph pasted where the candidate's passport photo was to have been affixed, and stopped Sansare. "I tried hard to convince him that the senior officials from Ulhasnagar had spoken to his superiors and informed them about the glitch, but he turned a deaf ear to my assertions. He kept shooing me away, saying angrily, 'Tu kai Salman Khan aahe ka? (Are you Salman Khan? )'," said Sansare. When he persisted, Sansare was taken to the senior officials at the recruitment camp, who in turn asked him to wait till they got clearance from the IT section. In course of his inordinate wait at the camp, Sansare called up the officials at the Ulhasnagar police headquarters, who agreed to speak to the officials at the Worli camp once again, and vouch for the fact that the photograph glitch was not Sansare's doing. "After waiting for four long hours, I was finally allowed to appear for my physical tests. The officials asked me to get a fresh rectified printout of my application form, and I appeared for the test," he concluded. The other side Special Inspector General of Police (Training) Amitabh Gupta, who is in charge of the police recruitments, said, "This should not have happened in the first place. I will have to check the papers and only then I will be able to speak on the matter." NCP leader's son turns terminator 2011-11-13 Mumbai In Ulhasnagar, son of former gangster and NCP party member attacks corporator's nephew As the upcoming Ulhasnagar Municipal Corporation election fever takes over the satellite town, tempers are flaring high, and the war between those in power and the ones to challenge them have begun. On Saturday, all attention in Ulhasnagar was shifted to Ward No 35, where the current councilor's wife is expected to fight it out against a highly placed NCP member, whose husband was once a notorious gangster. According to the police, on Saturday at 1.55 am, Omie, the son of the District President of the NCP Jyoti Kalani and Pappu Kalani, a former TADA accused gangster-turned-politician, entered Seema Apartment, where Mahesh Sukhramanni, councilor of Ward No 35 lives with wife Neetu. There, Omie with a gang of 10 is said to have allegedly attacked Sukhramanni's 28 year-old nephew Guddu. Guddu was beaten with iron rods, belts and sticks and Kalani is believed to have whipped out a gun and threatened to kill him. A member of the locality, 33 year-old Prakash Kalwani, who was buying medicines from a nearby pharmacy, tried to intervene and was beaten up too. Guddu was taken to Central Hospital, after which doctors transferred him to Wockhart Hospital. According to Inspector Kalyanji Gete of Ulhasnagar Police Station, a case of attempt to murder has been slapped against Omie. "We have registered an FIR against Omie and others under section 307, 324, 143, 147, 148, 149 and Arms Act (3), (25) of IPC. One accused, Hero Kukreja has been arrested. The rest are absconding," Gete said. When contacted, Sukhramanni claimed he had forewarned the police about an impeding attack from the Kalanis. "I had given a written complaint to the police (about the attack) and had also met the DCP, but the police turned a blind eye towards my complaint," he said. According to him, Jyoti is apprehesive of losing the elections. "Last week, Pappu sent me a message through Deepak Gajaria (former Congress councilor), asking us to vacate the ward," said Sukhramanni. While not denying the altercation that occurred, Manoj Lasi, Omie's confidante, said, "The police registered the FIR under pressure from BJP leaders Eknath Khadse and MLA Kumar Ailani. Guddu was drunk and was harassing women. The women asked Omie for help and when he rushed there, a heated argument ensued. We are demanding a CID enquiry in to the matter." Four-time MLA's son booked for attempt to murder Pradeep Gupta | TNN | Nov 13, 2011, 04.15 AM IST ULHASNAGAR: Omie Kalani, son of former Ulhasnagar MLA Pappu Kalani, and his 15 associates were booked in an attempt to murder case on Saturday. Omie and his supporters allegedly beat up BJP corporator Mahesh Sukhramani's nephew with iron rods and sticks. The victim, Sunil Sukhramani, sustained serious injuries and is admitted to the intensive care unit (ICU) at Fortis Hospital in Kalyan. The accused allegedly threatened Sunil with a revolver and asked him to tell his aunt, Neetu Sukhramani (Mahesh's wife), to not contest the election from Ward 35 in Ulhasnagar as Omie's mother Jyoti has decided to contest from there. The unseemly controversy has hit the powerful Kalani family, which has been holding important positions in the Ulhasnagar Municipal Corporation and representing the suburb in the Assembly, just a few months before the upcoming polls and may impact the electoral outcome. Pappu has represented Ulhasnagar as an MLA on four occasions. Sunil's friend Prakash Kalwani, who tried to intervene, was also allegedly beaten up and sustained injuries. Mahesh told the police that Omie and his supporters arrived at his nephew's residence around 1.55am and asked him to come outside. "As soon as Sunil stepped outside, Omie and his associates pounced on my nephew and thrashed him mercilessly. When Sunil's friend Prakash tried to intervene, they beat him up too," Mahesh said. "The men pointed a gun at Sunil and Prakash and asked them to tell my wife to not contest the election." Among Omie's associates who have been booked are Hero Kukreja, Rahul and Gurumeet Singh. The police have managed to nab Kukreja but the others are at large. "We are searching for the rest. We have also learnt that Omie doesn't have a revolver licence," said Arvind Patil, senior inspector, Ulhasnagar police station. Following the incident, BJP leader Kumar Aliani and Shiv Sena leader Rajendra Choudhary demanded that the police immediately arrest Omie and his associates. They also said that Pappu should be externed from Thane to ensure that the upcoming elections are conducted smoothly. In history ofUlhasnagar on Saturday morning it was first time when police has dared to enterin to Kalani Mahal owned by Pappu Kalani situated in OT at Ulhasnagar to searchaccused. A senior official from police department said on Saturday morning afterpolice lodge case against Omie Kalani they enter Kalani Mahal to search him butthey were not found. It is said that to search accused more than 20 police haswent inside Kalani mahal. Pappu Kalani has several criminal cases registered against him, including eight murder charges, though he claims all these are trumped-up charges. He was booked and arrested under TADA in 1992 and spent nine years in Yerwada jail. He is presently out on bail and has represented Ulhasnagar as an MLA on four occasions. Ulhasnagar Cong chief booked for extortion Pradeep Gupta | TNN | Updated: Nov 8, 2011, 01.46 AM IST Ulhasnagar: The Ulhasnagar's Central police have registered an extortion case against Ulhasnagar district Congress president Jairam Lulla, his six family members and a police constable posted with the Kalyan crime branch. The complainant and the main accused, Manohar Somai, are Lulla's relatives. "The complainant, who is embroiled in a land dispute with his brother Manohar, was asked to pay Rs 1 crore to settle the matter. He claims to have paid Rs 50 lakh to Manohar through Lulla and the other accused," said inspector R M Avhad of the Central police station . The other accused include Kiran Somai, Kamal Somai, Nandu Somai, Bihari Punjabi and the constable who has been identified only as Mane. Rubbishing the allegation, Lulla said the "police have registered a false case against him at the behest of ex-NCP leader Pappu Kalani, who is close to the complainant, to malign my image ahead of the civic polls". Said Kalani, "I am not even aware that an extortion case has been registered against Lulla."